Electric pumps manufactured by ‘CRIS Hermetic Pumps’ Company are repairable, and hence high durability. ‘CRIS Hermetic Pumps’ Company provides supply of any spare parts and repair and restore the entire range of pumps produced by us. 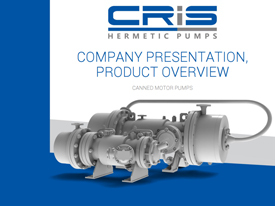 Send requests for spare parts for pumps manufactured by ‘CRIS Hermetic Pumps’ Company to the e-mail address: info@cris-com.md; +373 22474136.